Thank you to everyone who has sent kind messages for our 7th anniversary! Today we’re sharing some tips on how to start customising the mitten pattern if you’ve never used Stitchmastery before. First off, you’ll need to download Stitchmastery, which you can do for free in the demo version (which is the same software as the full programme, just with some features locked until you buy an activation key). Pop onto the Products page for Stitchmastery above and download the programme which matches your computer type – you’ll find more guidance there on how to do that. 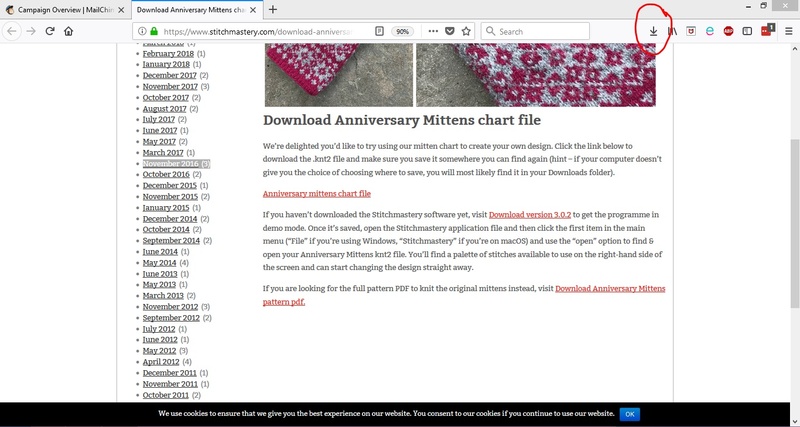 As explained in our first anniversary blog post, to access the working chart file for the mitten (or the PDF pattern) you’ll need to join our newsletter – the link will be sent to you when you sign up. If you’re already on the list, you should have been sent the links in our newsletter of 30th July – please drop us a line to hannah[at]knitmastery.com if you are missing the email and we’ll make sure that gets to you! 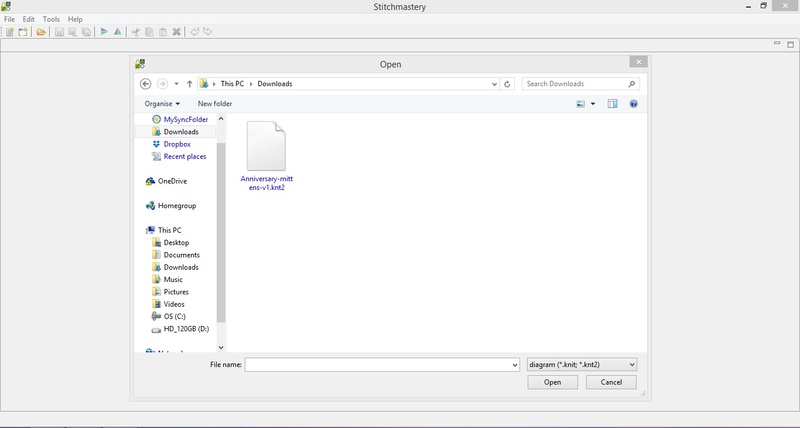 As you can see, my laptop does not suggest Stitchmastery as a programme to open the file with, so choose Save File instead. Depending on your system, the downloaded file may save in your Downloads folder, or a temporary folder. Using Firefox on this version of Windows, an downwards-facing arrow appears just to the right of the address and search bars in my browser (circled in the screenshot below), and when I click on that symbol I can open the folder which contains the file. Make sure you know where it is, and if you’re not sure how to find that location again, save the file to somewhere easier to locate, perhaps your desktop or a specific folder. 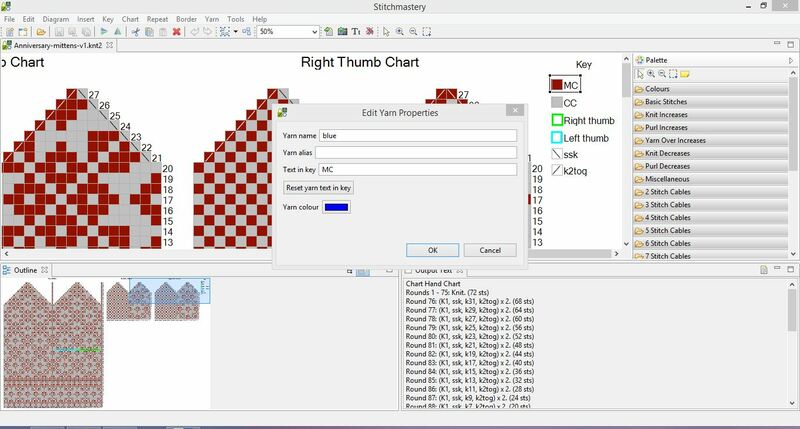 When the chart opens you’ll see the hand and thumb charts, and you can scroll to the right to see the key. It’s a large chart so you might find it helpful to zoom in or out using the % function in the top icon bar, or use the + and – magnifying glass buttons. One thing you may like to change with the chart is to replace one of the yarn colours with a different colour – to do this, click on the yarn in the key you’d like to change. You can see I have selected the main colour in the screenshot below. As you can see, Stitchmastery automatically changes every cell containing that yarn colour, including stitches which are decreases rather than plain knit stitches – all blue at the click of a button! 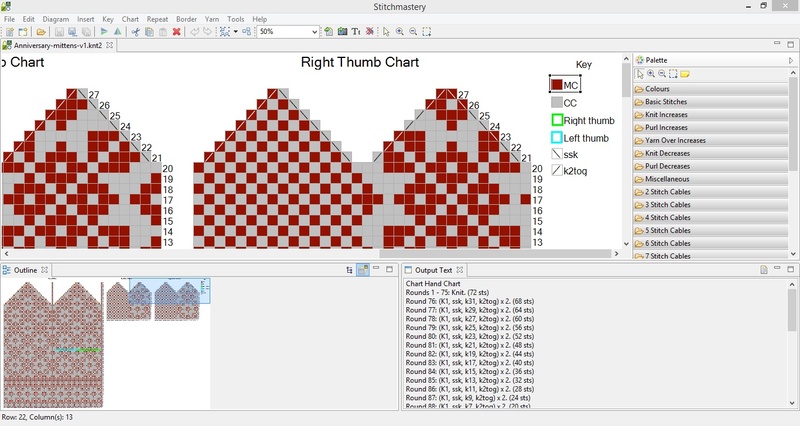 There are lots of other things you can do to edit the mitten pattern, eg removing rows to shorten them, changing the rate of decreases by adding extra rows and spacing the decreases, and much more. The User Manual is a good place to start to learn how to do these things. One thing that the demo version of Stitchmastery does not allow is saving or exporting a design. 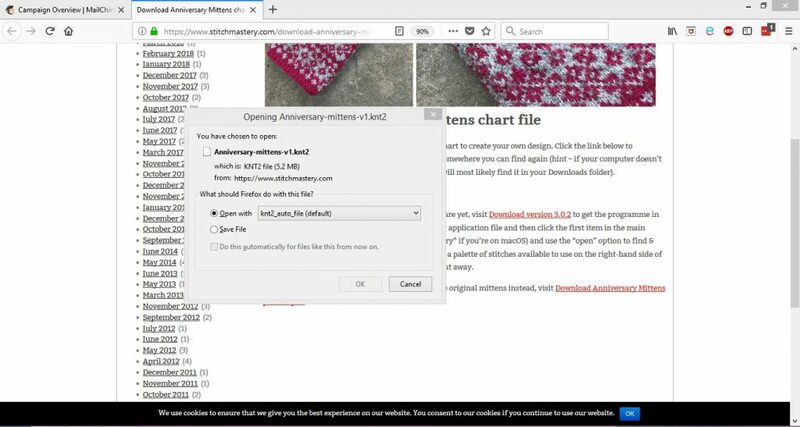 So if you feel happy with your pattern and perhaps would like to export it to use in a design to publish (we are happy for you to use the mitten template to do this) then you will need to purchase an activation key from our website. Without closing Stitchmastery, you can then enter your activation key by opening the Tools menu and selecting Activate from the end of the drop-down menu. We’d love to see what you come up with – either an image of the chart or a photo of your finished mittens! Share them on Instagram with hashtag #stitchmasteryis7 or add them to our Ravelry thread. Our Ravelry board is also a great place to ask any questions if you have any uncertainty using the software. Knitting Chart Editor Demo Video now available!